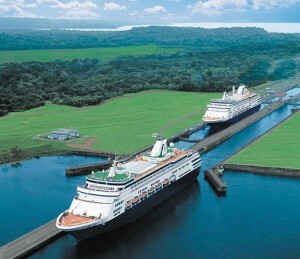 Going through Panama Canal is always a fascinating experience. When we booked our shore excursion on the famous Panama Railroad, we didn’t expect to catch a glimpse of the prison where former dictator Manuel Noriega spends his days, or see a large snake lying dead in the flat bed of a pickup truck. But that’s the joy of heading ashore in Central America, where the sights are exotic and somewhat chaotic. 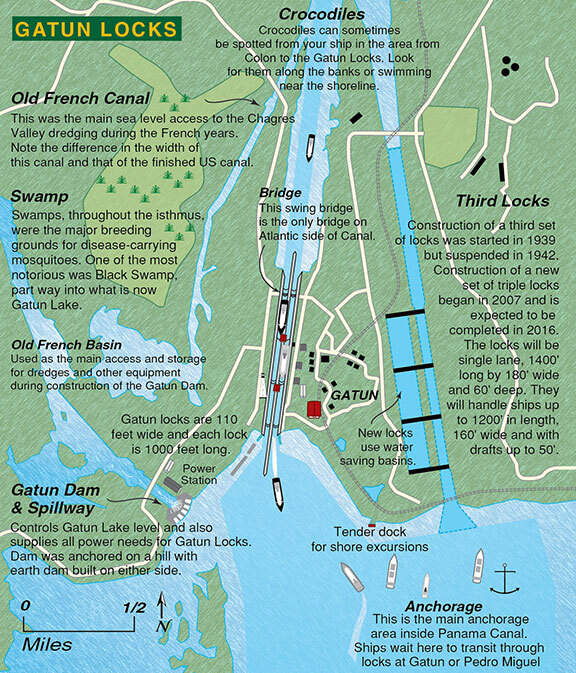 Map of Gatun Locks including new third set of locks. We were a family of four enjoying a spring break cruise aboard Holland America’s Zuiderdam when we disembarked by ship’s tender in Gatun Lake to spend a day exploring the tiny country of Panama, from coast to coast. I had already done a full transit of the Panama Canal on a cruise from Fort Lauderdale to Vancouver, but most ships don’t actually stop in Panama when travelling from one ocean to the other. On a partial transit you not only experience the canal’s colossal locks lifting your ship 85 feet above sea level and releasing it onto a man-made lake surrounded by tropical rainforest, you have the option of going ashore to see the local sights. 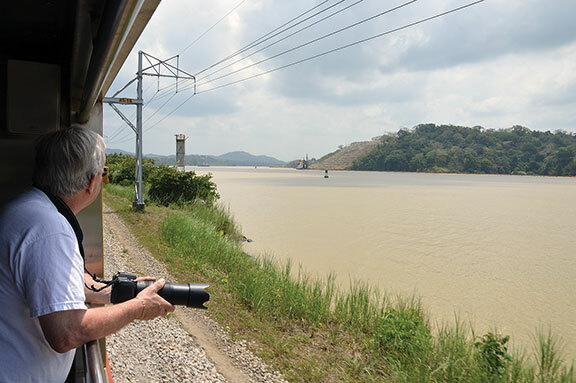 We opted for an excursion on the famous Panama Railroad, which straddles the Isthmus of Panama and played a key role in construction of the canal. This journey in vintage rail cars through the jungles of Panama was one of the best excursions of our cruise. We were taken by bus to the train station, where we were greeted by railroad employees and directed to our car. View of Panama Canal from train near Culebra Cut. In comfortable facing seats separated by a small table, the four of us settled in for our ride, which traces the Canal and provides up-close views of the jungle that claimed thousands of lives during the Canal’s protracted construction – first attempted by the French (who eventually abandoned their gallant effort), then successfully completed by the Americans, who opened the Canal to the world in 1914. A man-made wonder, the Panama Canal continues to function as a maritime shortcut between the Atlantic and Pacific Oceans. Full transits of the Canal (from Florida to California and vice versa) are popular itineraries, especially in spring and fall when cruise ships are repositioning between the Caribbean and Alaska. 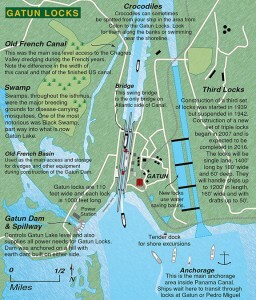 During the winter months, several cruise lines also offer partial transits of the Canal. These round-trip cruises usually depart from Fort Lauderdale. Holland America Line’s 10- and 11-day itineraries feature several port calls in the Caribbean, such as Aruba, Curacao and Half Moon Quay (HAL’s private island in the Bahamas). Other port calls include the Spanish-colonial walled city of Cartagena in Colombia (where we enjoyed an historic walking tour) and Puerto Limon in Costa Rica where we took a river safari to view tropical wading birds, basilisk lizards and the occasional crocodile. Our Panama Railroad excursion ended back in the Caribbean port of Colon where our ship was waiting. Those passengers who had opted to remain on board got to experience the Gatun Locks for a second time as the ship was lowered back onto the Caribbean Sea. I chatted with a couple staying in an aft cabin and they watched the action from their private balcony. I highly recommend a partial-transit cruise of the Canal. 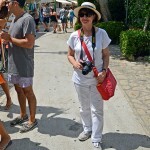 It combines a Caribbean cruise with the chance to see an iconic monument of modern engineering. Plus, you can go ashore and ride the rails across the famous Isthmus of Panama.